Layering is a concept that has been around for a while in fashion and many of us are experts at layering and combining clothes to create our own, ‘personal look’, whereas fragrance layering is still relatively new. Regardless of whether you are speaking with catwalk designers or high street boutiques, they all talk about layering. Playful layering is always on the style agenda, especially when navigating the changeable weather conditions of the Spring and Summer Seasons. We can indulge our creative sides by mixing different textures and fabrics with a variety of lengths and colours and then accessorising them with scarves and jewellery. Now, men’s fashion is also turning to luxury layering and it could be seen at recent catwalks in Paris. When we are not yet entirely sure of the weather, when one week we are basking in tropical temperatures, to running for cover from a mini-monsoon the next, we have all become dab hands at the tricky art of layering our clothes to be prepared for different conditions. Layering is not only associated with one’s outfit but can also include our perfume. The latest trend is taking the skill of layering clothes and adapting the principles to our skin, by layering our perfumes and beauty products for a more dynamic and unique scent. The key to mastering layering is knowing which notes work well together and how they enhance each other. It is all about incorporating the right scents into your beauty routine to make your perfume work harder for you. When thinking about layering perfume it is important to remember that fragrances have top, heart and base notes. • For Spring and Summer, the nicest combinations of fragrance layering is created when you combine light with heavy fragrances. For example, you can adapt your typical ‘winter’ or ‘evening wear’ fragrance for summer use by layering a fresh, light scent over the top. • Take one of your ‘classic’ perfumes and layer something ‘trendy’ over the top. • Start your journey towards professional fragrance layering, by using fragrances which are as close as possible to single ingredients, such as the very trendy ‘soliflorals’. • Alternatively, use fragrances from the same fragrance family to start with, such as floral, oriental, herbacious, citrus, wood, etc. Once you are pleased with your results and become more confident, you can combine perfumes from contrasting families, such as layering citrus over oriental, floral over woody, herbacious over musky. • Begin with the heavier of the fragrances you plan to combine and use them sparingly, as they may overpower the lighter notes you have in mind. You may have to use more of the lighter fragrance to counterbalance the impact of the heavier perfume. • Layer by combining different applications. Fragrance oils will naturally bind with the oils in your moisturiser or body oil. This insight allows you to layer a light, fresh eau de toilette over a heavier, rich body lotion. • You can also layer by applying fragrance to different parts of your body. For example, start with fragrance on your pulse points (wrist, elbow, neck) and finish with a different fragrance for your hair. Alternatively, a fragrance on your wrists and elbow easily combines with another fragrance for your neck or under your arms. Be prepared to share your secret, when you receive a compliment. The compliments may come from the most surprising directions. The concept of layering can also be adapted to fragrances in our home and the same basic rules apply. Many real estate agents are known for warming bread in an oven for open houses or preparing fresh coffee to welcome the visitor to a viewing. Smells send out subliminal ‘welcome’ or ‘comfort’ messages when you open the front door. This is exactly what you do when you welcome people into your home. Take this a step further by combining various fragrances in your home to provide a multitude of sensorial experiences when walking from one room to the next, as fragrance layering can really enhance the ambience of your home. One of the reason’s why we struggle to perceive the fragrance we apply to our skin during the course of the day, is that our noses get used to our own fragrances. They literally get ‘saturated’. The mistake in layering fragrances at home is consequently to use fragrances which are ‘too similar’. Imagine you have just been in your bedroom which has a beautiful floral fragrance, and then walk into the corridor, also with a floral fragrance. It is likely that your nose will have difficulties noticing the difference. Instead, we suggest that you distinguish between the ‘spine’ of your house and the ‘outlying’ rooms. In the spine of your home, which are corridors, hallways or any other central room in your home, you should have a distinctly different fragrance from the connecting outlying rooms, such as bedrooms, living rooms, and bathrooms. For example you could use heavier fragrances from a similar ‘olfactive range’ in the entrance hall (for example a vanilla fragrance) and then entice your visitors into your living room with a lighter floral perfume, such as a beautiful rose note. Equally, you can do the same and contrast ‘herbal’ fragrances with ‘fruity’ or ‘floral’ perfumes. Innocent Vanilla: A rich white floral top note of Louisiana magnolia invites you into a soft, enveloping heart of white musk, infused with crushed vanilla pods and resting on a base of sandalwood. This is an ideal, heavier ‘base’ fragrance for your home, as it combines exceptionally well with other fragrances. SPA: A beautiful aquatic note with a tangy, effervescent top note of bergamot, mandarin, rosemary, lavender and fresh violet leaves. Radiation from heart are sea salt and mineral notes, with aerial and translucent flowers (lily of the valley, jasmine) and accents of green tea. The fond is layered with vibrant woody (cedar, patchouli), ambery and mossy accords (oakmoss). This is a lighter, fresher ‘base’ perfume, around which you can easily layer other perfumes in your home. Black Orchid: An exotic fragrance with rich top notes of Anjou pear, dark cassis and orange slice. The heart is elegantly floral with notes of black orchid, powdery violet, olive leaf, freesia and ginger flower leading to a sensual base of musk, copahu balm and vanilla pod. Trail of White Petals: A delicate and yet sparkling white floral note infused with jasmine blossom, interlaced with lily, white rose and ylang-ylang. The top note has a hint of apple and the fond rests on a base of precious sandalwood and musk. Pink Grapefruit: A vibrantly pink grapefruit fragrance with added complexity from mandarin, lime and bergamot. Floral notes of jasmin and lily lend a feminine touch and deep sophistication comes from a sandalwood accord in the base note. Neroli & Olive: The distilled fragrance of the Mediterranean: a sophisticated accord built around the vibrant citrus notes of neroli, pomelo and lime and yet softened with jasmine petals. Vertiver, patchouli and leather add depth and complete the sensation of walking through an olive grove on a warm, sunny day. 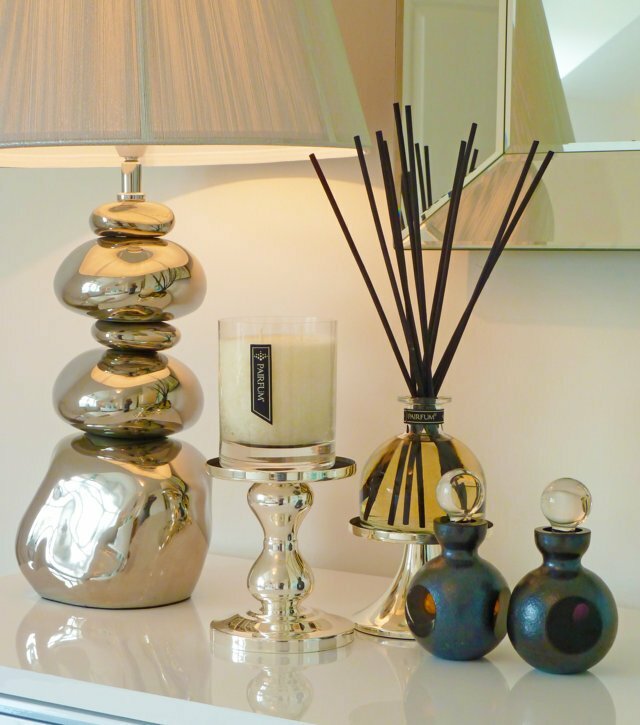 Another form of layering fragrances at home is contrasting continuous ‘base fragrances’ with sporadic ‘accents’. For example, imagine your bathroom with a continuous, beautifully warm vanilla fragrance but then you come home and prepare a bath and would like to add a relaxing lavender scent. Alternatively, you have a wonderfully floral fragrance in your living room but in the evening you may wish to add something ‘light & fresh’ to compliment a soft balmy evening, or ‘warm & comforting’ to keep the winter chills at bay. Layering fragrances in these situations is similar to layering perfumes onto your skin: you use a base fragrance and then add an accent over the top. 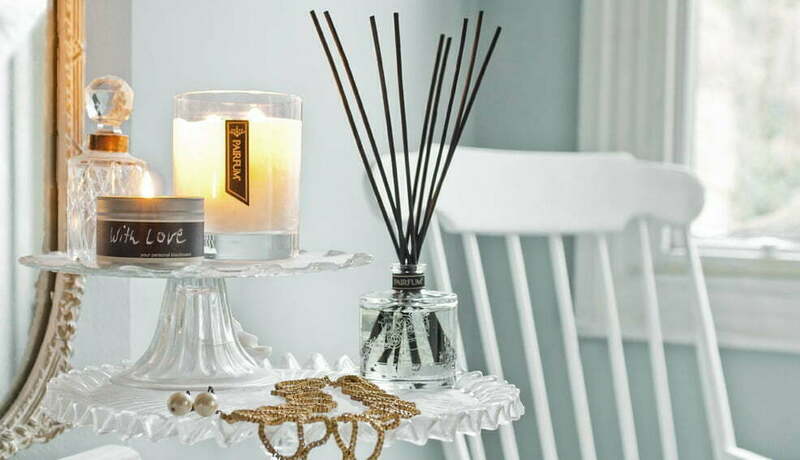 The ideal product to give your rooms a base fragrance is a reed diffuser. Products that can add an accent are natural perfume candles or room perfume sprays. Another suggestion is to use a bouquet of beautifully fragrant flowers for the base note, for examples ‘lilies’, and combine these with a luxurious fragrance candle to give your room the desired atmospheric accent when your visitors arrive. There are many other creative ways how you can think outside of the box for a base fragrance, and an accent in each room. The PAIRFUM London Collection offers you healthy and luxurious options for base and accent fragrances to suit your rooms. The PAIRFUM Collection is designed to be displayed proudly in your home and will fit perfectly into any interior style, regardless of whether this is ‘minimalist’, ‘country cottage’, ‘funky’ or ‘palatial’. The sophisticated yet subtle blending of the perfume notes in the fragrances makes them a welcome addition to any home. The PAIRFUM London collection is available online in our boutique.